A gear wheel placed between two other gears to transmit motion from one to the other. It does not alter the speed of the output, but it does alter the direction it turns. 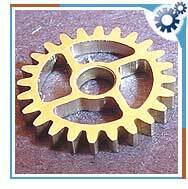 It is used to ensure that the rotation of two gears is the same. An idler gear is placed between two gears. The idler gear rotates in the opposite direction as the driver gear, and the follower gear rotates in the opposite direction of the idler, the same direction of the driver. It is also used to change the spacing between the input and output axles. It does not change the gear ratio between the input and output gears. All the gears and wheels that turn inside the treads of a battle tank are all idler gears that transfer power from the input gear to the output gear to move the tread and move the tank forward. The power take off mechanism includes a gear train with an input idler gear, a first intermediate idler gear, a second intermediate idler gear and an output gear. The input idler gear receives a rotary input and the first intermediate idler gear meshes with the input gear and the second intermediate idler gear. The output gears transmit rotary power to one of the first and second axles.